Ecoease is owned by the Internet Shop Ltd., a small, British, family-run company based in Corby, Northamptonshire. Ecoease was established in 2010 and since that point has become one of the most recognised forms of environmentally-friendly secondary glazing, with all panels able to be re-used or recycled. We are proud to offer the Ecoease secondary glazing panels to help you improve your home, environment and quality of life. Ecoease uses established double glazing principles with our unique PVC-edged magnetic sealing system to achieve cost-effective acoustic and thermal insulation for existing windows. Thermal insulation is greatly increased, keeping cold air out and ensuring heat loss is significantly reduced. Reduces incidence of ‘cold spots’, providing greater home living comfort. Noises from outside can be significantly reduced, providing peaceful home living conditions. 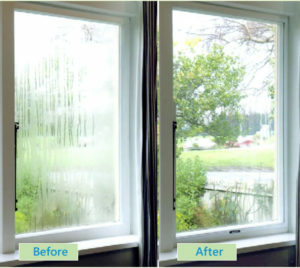 Condensation problems are usually eliminated, saving time on morning mop-ups and preventing the growth of unhealthy mould and mildew on window frames and curtains. Unique edging system for a far superior finish – rather than the magnets sticking straight on to the sheet. Ecoease secondary double glazing is the only secondary glazing system to supply PET clear plastic sheet (Polyethylene terephthalate), the most recyclable plastic on the planet. All other components are completely recyclable. We pride ourselves on producing an environmentally-friendly glazing option. PETg has high optical clarity – beautifully clear and unobtrusive. Custom-made & easy to fit – Our Measure to fit panes come fully prepared for you with magnets already attached, so you can simply offer it up to your window. No DIY skills are needed and they offer a perfect fit for your windows. If you are more comfortable fitting the edges and corners yourself, we can also supply the individual panels, edging strips and corners, on a fully DIY basis. Fire Safety – PET is fire retardant with a class 1 Fire Rating (unlike acrylic which is class 3.) NASA testing photos show the comparative flammability of polycarbonate, PETg and Acrylic. We also offer free delivery for all Measure to Fit orders and for DIY orders over £100 (except for the Highlands and Islands*), and turnaround can be as quick as 7 – 10 working days. *Delivery can be organised for the Highlands and Islands, with prices according to the weight and size of the package. Please contact us for more information. If you want to read some success stories, have a look through our customer reviews.